Founded in 1907, Hershey Park has been a staple of Pennsylvania for over 100 years. Originally developed as a simplistic park, complete with a baseball field, wooded groves and a pavilion all provided countless hours of entertainment to the surrounding area. But the park was quickly expanded and it soon became much more than a regional attraction; it became a national wonder. Today, millions of visitors from across the country visit the Sweetest Place on Earth every year. 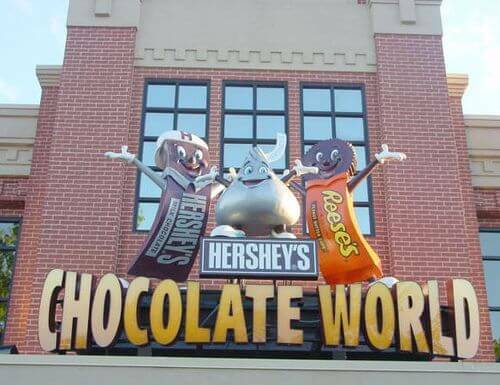 Considering my deep connections to the Hershey Company, I’ve visited Hershey Park countless times. It is truly amazing to see just how far the theme park has come since its inception. The countless upgrades and additions have really made it a phenomenal place to visit. And while every ride and attraction has its own unique charm, there are a few rides that stand out among the others. Here are a few of my favorite rides at Hershey Park. If you are looking for the ultimate adrenaline rush, Sky Rush is, without a doubt, the ride for you. With a maximum height of 200 feet, a speed of 75 miles per hour and the lack of a traditional over-the-shoulder harness, Sky Rush will leave you breathless. The ride leaves no time for second-thought as it immediately makes its 200-foot ascension from the starting gate. Once you’ve arrived at the top, gravity takes over the rest as you plummet at intense speeds and take on five zero-G hills. Sky Rush will leave you speechless, and craving for more. Where Sky Rush gradually takes its riders on a 200 foot climb, Storm Runner wastes no time. From the starting gate, Storm Runner launches riders at 72 miles per hour in two seconds flat. You are then taken 18 stories high and dropped just as quickly. The ride also features twists, turns and loop-de-loops galore. While it may be closed for the winter season, Tidal Force is one of the greatest, and most classic, rides that Hershey Park has to offer. You’ll hold on for dear life as you are dropped 100 feet into several gallons of nice, cool water. And the ride doesn’t stop once you’re off; before leaving, make a quick stop on the overlooking wooden bridge and get soaked by another splashdown. It’s the ride that keeps on giving. These are only a small fraction of the amazing rides that Hershey Park has to offer. And for those of you who are not looking for an adrenaline rush or have small children, Hershey Park has you covered as well. The park also features seasonal events and activities. Regardless of what kind of attraction you are looking for, Hershey Park has something for everyone.